The proposal calls for the construction of a new facility that can convert formed solid sulfur into molten sulfur, store the molten sulfur, and then transport it by barge to the Aurora Phosphate Mine in Beaufort County, NC. Once complete, the boilers would be able to produce 5,000 tons of liquid sulfur per day. Molten sulfur would be transported by barge via the inter-coastal waterway. 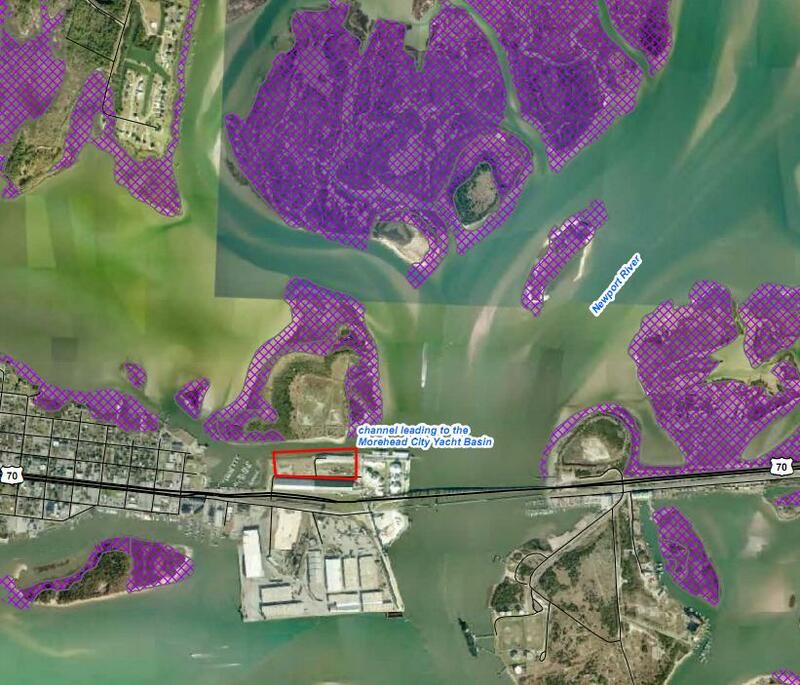 This would require a 400 ft expansion of the existing docks to accommodate additional barges. Molten sulfur is essential for the production of sulfuric acid, which is then used to manufacture phosphoric acid from phosphate. The phosphoric acid is a key ingredient in commercial fertilizers. Molten sulfur is produce by melting formed solid sulfur at 235 F and running the resultant liquid through a filtration process. The process also produces Sulfur Dioxide, a major air pollutant and one of the primary agents that causes acid rain as well as respiratory problems. The current OSHA permissible exposure limit is 5 ppm, although industry health and safety organization recommend short term exposures of no more than 0.25 ppm. Major activities and site improvements include the construction of two 2,500 tons per day sulfur melters, the minor modification of the existing conveyor gallery, the construction of two new storage dome structures with 90,000 ton total storage capacity and with a future third dome footprint allowance, the construction of two new 15,000 ton liquid sulfur storage tanks, and the construction of two new boilers and relocation of one existing boiler from Radio Island for melting and maintaining the sulfur as a liquid in the storage tanks (Figure 3). The two storage domes, base, conveyors, and platforms will be approximately 32,800 square feet and 152 feet tall (160 feet above sea level). The boiler building will be approximately 6,400 square feet and 27 feet tall. The control room and lab will be approximately 1,600 square feet and 15 feet tall. The fire water tank and pump house will be 300 square feet and 15 feet tall. There will also be two roof structures totaling 3,500 square feet, approximately 35 feet tall over the sulfur filters. The sulfur filters will filter impurities from the solid sulfur. The Berth One area will be upgraded to enable molten sulfur to be off-loaded from ships and pumped to new molten storage tanks. Piping, valves, and a jib crane will be installed to facilitate connection to on-board discharge piping. Sulfur piping will be installed from Berth One to the new molten sulfur storage tanks. The total disturbed land area for the main process areas described above and the control room and parking is approximately 3.8 acres. 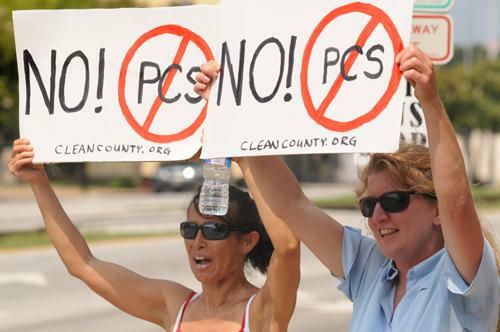 It’s possible that the project may not negatively impact the environment, but given the information they’ve provided, along with the EA, I would not be able to reach that conclusion, and I doubt PCS Phosphate would, either. Public opposition has be swift. Citizen groups have already mobilized to petition the Governor, local councils have vocally condemned the project, and even the US Army has stated that the construction could compromise vessel operations. Complaints range from concern for the environment, to damage to fisheries, to loss of tourist revenue. At this point, the future of the project, and the impact on the environment is uncertain. Over the next few days we’ll dissect the issues at hand, and attempt to place this project and the politics involved in a broader context. While we are not necessarily opposed to new industrial developments, it should be obvious that we are biased in favor of socially and environmentally responsible development, not half-executed assessments conducted in secret. You can keep up to date with recent news at http://cleancounty.org/. World’s oldest known bonnethead shark captured in South Carolina! Thanks for your excellent coverage of this sulfur fiasco. Deals done in darkness and behind closed doors don’t look so good when the light shines on them. The community is galvanized into action and will not rest until this sulfur deal being foisted upon them by some politicians and a multi-national corporation has been put to rest. There are no benefits whatsoever in having this toxin-spewing development in our midst. We say no to molten sulfur. PotashCorp: Get your ash out of here. Please keep up your coverage. We need all the help we can get in this David versus Goliath fight. We’re fighting for our lives. Well said. We have a real Gem in the Crystal Coast in which we must protect against exploitation by firms such as POTASH. I am just surprised our NC Governmental officials on the Ports Commission and other areas with knowledge have let this get so far without informing the public. I think the Governors Office should consider replacing them all! What about CAMA permits? Any structure built with in so many some feet of the waterway is suppose to go thru a CAMA permit process and have an impervious surface restrictions. The CAMA permit is the final permit they need before construction begins and I’ve been informed through the grape-vine that they’ve be asked to revise and resubmit. Cleancoast.org is the local grassroots organization that’s working to fight this smokestack molten sulfur manufacturing plant. Please go to their web site and voice your opinion, sign the petition to keep this stinker off the Crystal Coast–and find contacts of state officials who need to hear from you. Save the Crystal Coast and say no to the Sulfur Coast. The CAMA permit is only for the dredging necessary to widen the barge berth–nothing else. All other permits were granted as “extensions” of those all ready existing, since PCS stated that they were only expanding ongoing operations. You define “expanding” for me. This is a whole new process and use. More smoke and mirrors. Follow the money ..who in the local government has been paid off to help them sneak in here and pollute our state..sounds pretty much like some corruption in local government…they need to be identified and brought to justice…..look outside of the box..and inside..
We hold our nose at the stink, and our elected officials’ mendacity and oppose this blatant intrusion on the last remaining raw seacoast, Cape Lookout National Seashore, Rachel Carson Nature Reserve, Shackleford Banks where wild horses wander and sea turtles haul out, and other endangered species, which now includes us, live in nature. After we toos out the blundering fools who approved the noxious enterprise in secret and find out who’s behind the repeal of the state law intended to save our coast, we need to insure this terroristic threat dies in full public view.